Now that I've returned to the freezing Midwest I'm back on a steady diet of white bread, cream cheese, coffee, and whatever they're feeding residency applicants on interview days. One of the things I was most looking forward to on my vacation in the Philippines was the food and boy, was I not disappointed. This is a love letter to the new gastronomic heights I attained last month. Oh Filipino food, how I've missed you so. Kare-kare, sisig, dinuguan, piniritong tilapia, tapsilog, longsilog, all incarnations of -silog. You may be too rich for foreign folk but that's only because they can't handle your almighty mix of grease and sauce and flavor. On our trip to Baguio I was pleasantly surprised to see some new dining establishments, a welcome break from the Country Club and The Manor that we usually visit. For example, Ayala has built a Technohub near the Commissary. Most of the restaurants within are imports from Manila (Sumo Sam, Brothers Burger, Moonleaf) so we were happy to dine at Everything Nice Cafe, a Baguio local. 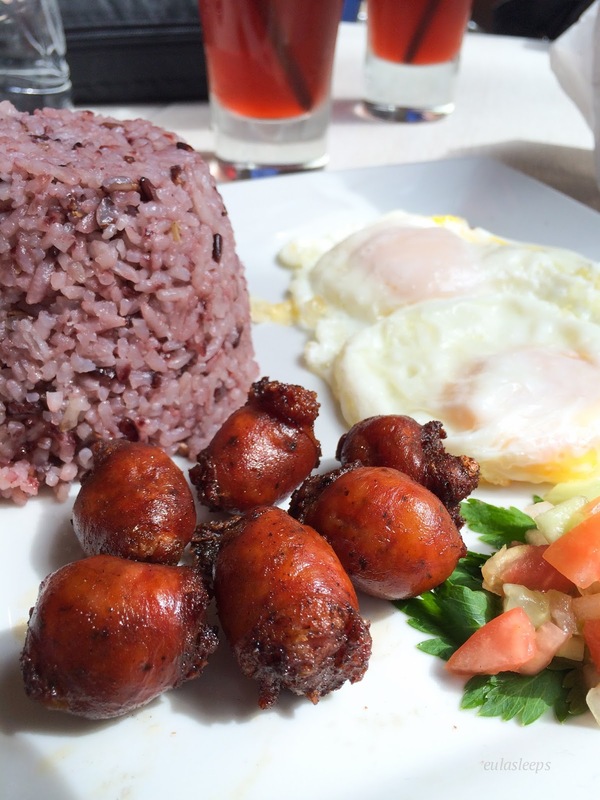 Their longganisa is flavorful and juicy, with a touch of sweetness, pairing very well with Baguio's famous brown rice. I was ridiculously happy eating it. Pastries are my go-to quick merienda and breakfast, and lunch, and dinner. 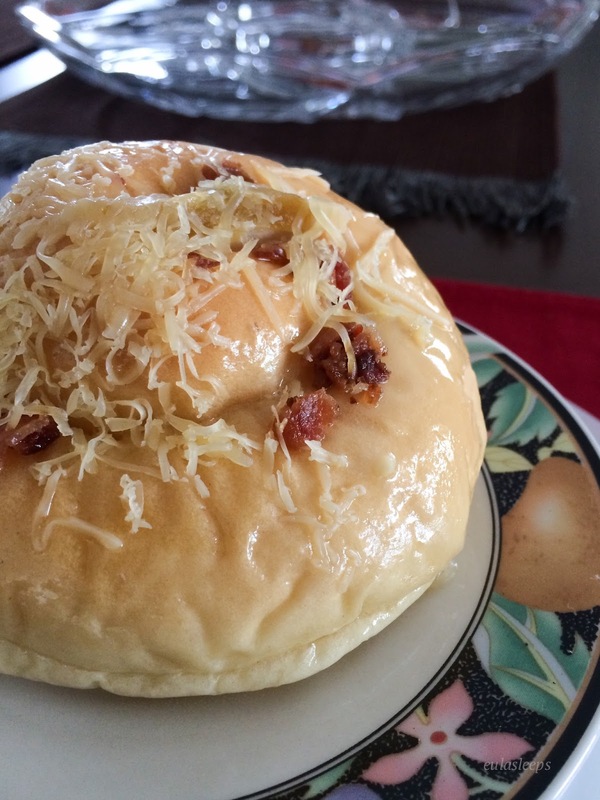 Behold this sugar-glazed bacon-topped ensaymada. It seriously tastes like a deep-fried glazed donut in ensaymada form, with bonus bacon bits. Excellent with coffee. 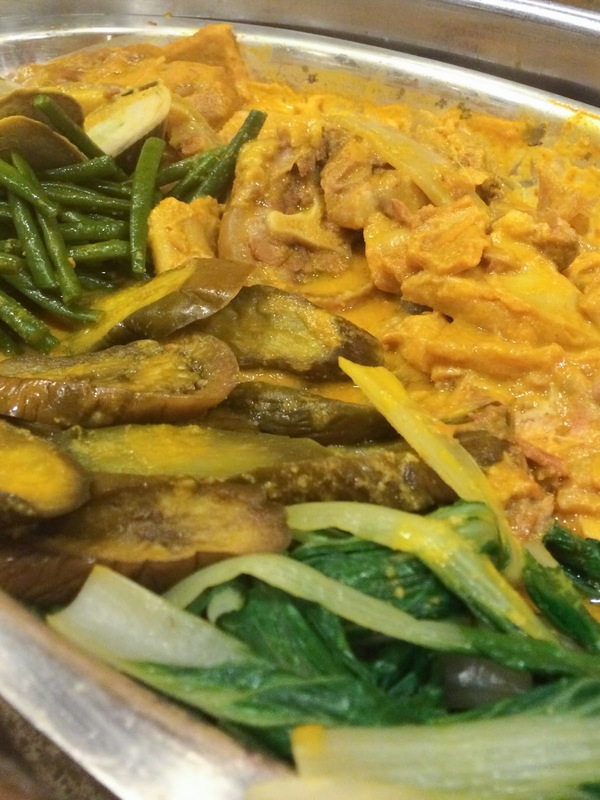 And of course, kare-kare. Delicious ox tail and fresh greens sweetly stewing in a rich nut buttery sauce, who can travel to the Philippines without sampling this gout attack waiting to happen. The Via Mare incarnation below wasn't the best I tasted on that trip (although it did taste healthier than usual, low-salt or whatever pssshht I'll worry about that when I survive residency), but it's the only photo I've got mrrhrhrr. I haven't gone around Chicago much so surely I haven't tasted a fraction of the best Asian fusion cuisine the city has to offer (Sunda being on the forefront so far). Still, I often crave good Asian food here and am left unsatisfied. Understandably, I kind of binged on it during my vacation. Bubble Tea (a Tokyo import) is an old favorite. 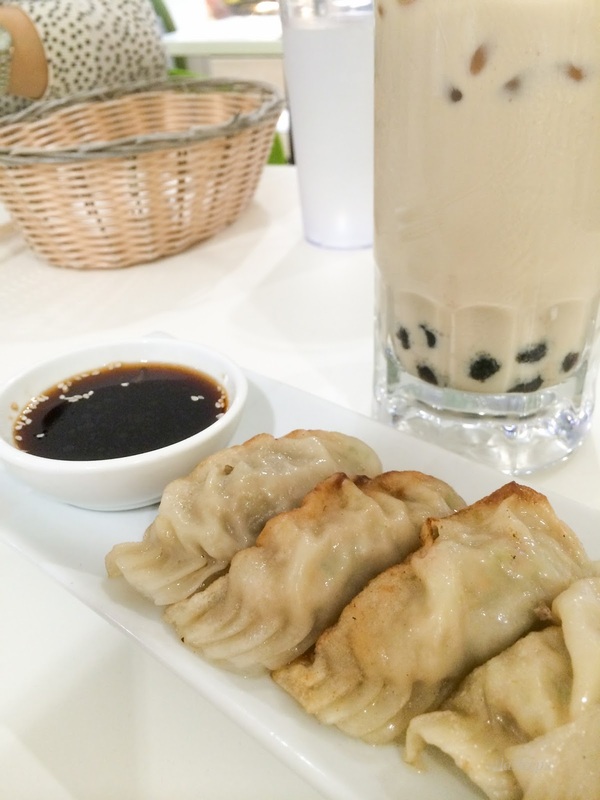 I love their rolls and milk teas -- their pearls are of the best consistency, soft and chewy, never gummy or flaky. They also have one of the best gyoza I've had, meaty and juicy. (Osaka Ohsho's is another.) I can see myself eating at Bubble Tea every day. The new wing of Shangri-la Plaza Mall is burgeoning with young restaurants. We dined at Kimukatsu, which prides itself in mille-feuille katsu, 25 layers of pork cutlet breaded and deep-fried. Like Yabu and Ginza Bairin, Kimukatsu meals come with unlimited rice and cabbage. 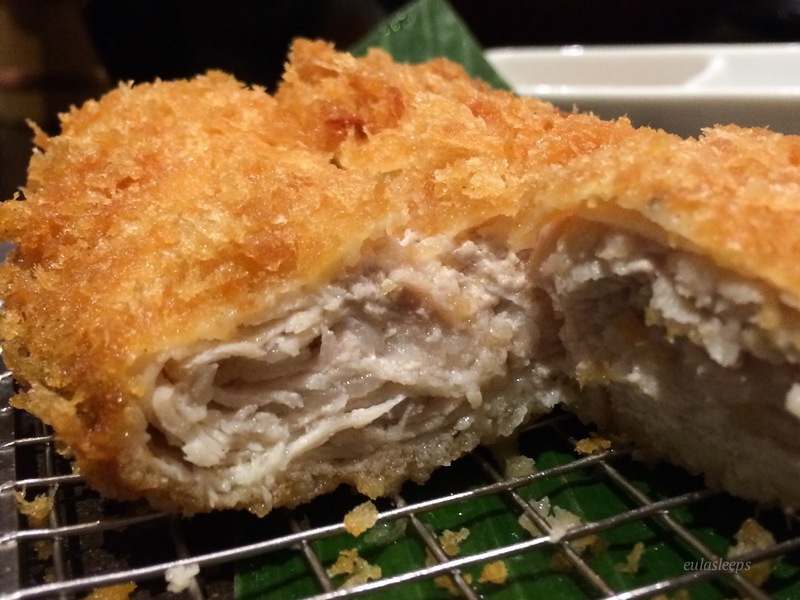 Personally I prefer the usual solid tonkatsu, but this is a welcome change when you tire of that and yearn for a different texture. I met up with college friends at Hole in the Wall in the new Century City Mall in Makati. It's a quaint little cafeteria-style space for young people, and if my intolerance to the noise level inside is any indication, I am rapidly outgrowing this scene. The food, however, is delicious. There was quite a line at Bad Bird, for good reason. 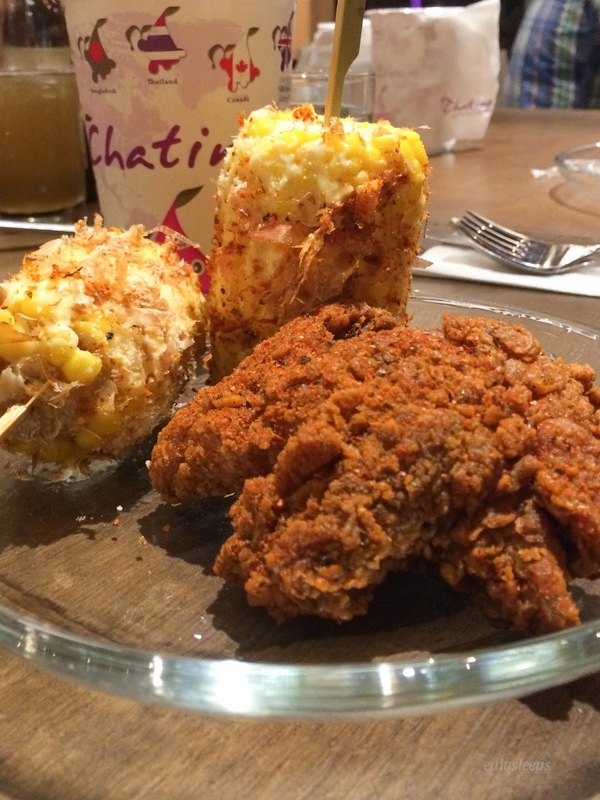 I had the spicy umami chicken and corn on the cob -- both excellent. The meals come with two pieces of chicken and 1-2 sides; I opted for the ala carte orders (one piece of chicken) because I had just come from a heavy merienda. The portions were just right. The chicken skin is wonderfully crunchy, the spices penetrating into the meat. And the corn, the corn! Steamed but firm, with Japanese kewpie mayonnaise, bonito flakes, and Togarashi umami spices. I'm craving it right now. Every once in a while I have #burgercravings, which I choose to attribute to my body craving more nutrients in the form of artery-clogging ground protein. 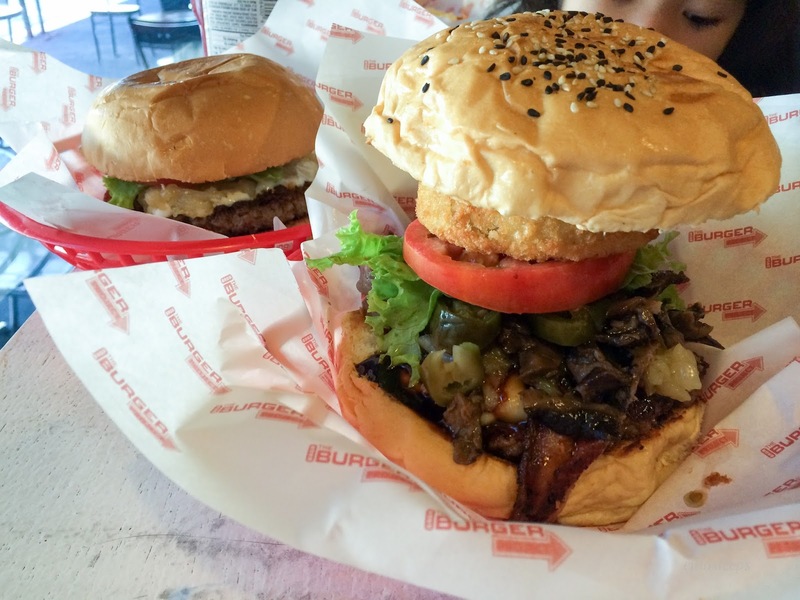 Army Navy and Brothers Burger are two favorites, but I was all for trying out new places. 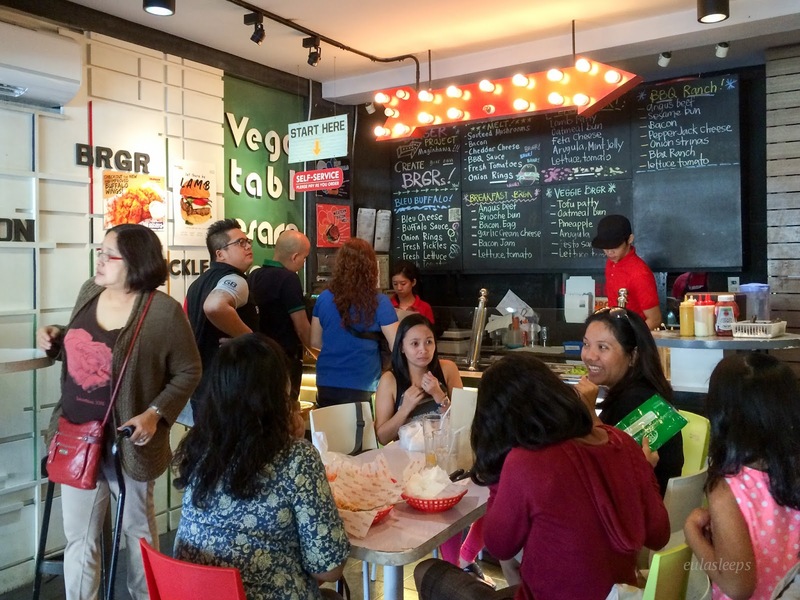 I've long wanted to try out Brgr Project along famed Maginhawa St. In case you've been living under a rock for the past few years, it's a tiny little space where you custom-order your burger by choosing from a list of ingredients and toppings. I went for an Angus patty with veggies, caramelized onions, blue cheese, and wasabi sauce on a brioche bun. My brother was more adventurous, adding bacon, onion rings, mushrooms, and some sort of barbecue-looking sauce. The caramelized onions were kind of disastrous, not caramelized or sweet at all, tasting more like mushy onions strings. The patties were delicious however! In hindsight, the breakfast burger suggested on the board would probably have turned out better. I would also pass on their PhP 145 animal fries, which are simply sweet potato fries with a ketchup+mayo dressing, cheese sauce, and grated cheese (Quickmelt?). 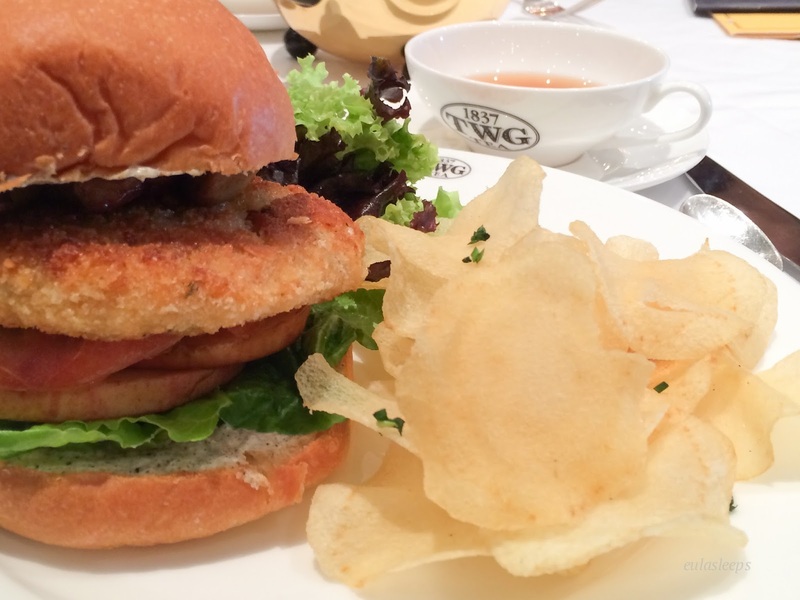 Moving on to ~fancier burgers, I had afternoon tea with some of the girls at TWG. /waves It was my first time there and I was so pleased with their dining selection! It's a little pricier than what I'm used to but heyyy I have a steady paycheck now and good food is something you should allow yourself to splurge on. I had the seafood foie gras burger on a brioche bun, which was a crabcake-like patty with lettuce, tomatoes, and crispy apple slices topped with foie gras. It was absolutely divine. For tea I had a floral vanilla mix that was just the right amount of sweetness, even without sugar. So glad you suggested TWG, Liz! Oh, my favorite meal of the day. I often have more courses of dessert than appetizer and entree combined. 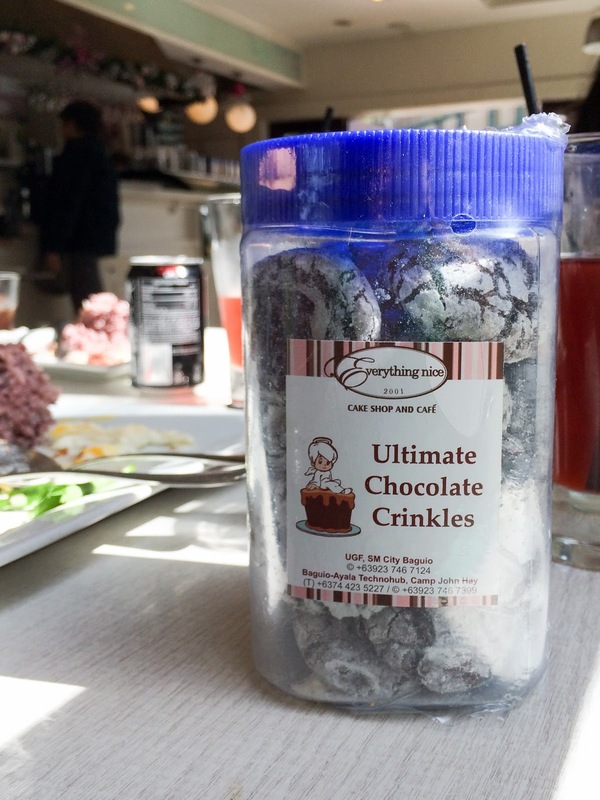 The aforementioned Everything Nice Cafe has the BEST crinkles I have ever tasted, aptly named Ultimate Chocolate Crinkles. At PhP 250 for 20 pieces it's not the cheapest, but these are the most moist, chocolately, almost gooey crinkles I have ever had the pleasure of ingesting. I would have hoarded if I'd thought they'd make it to the US. 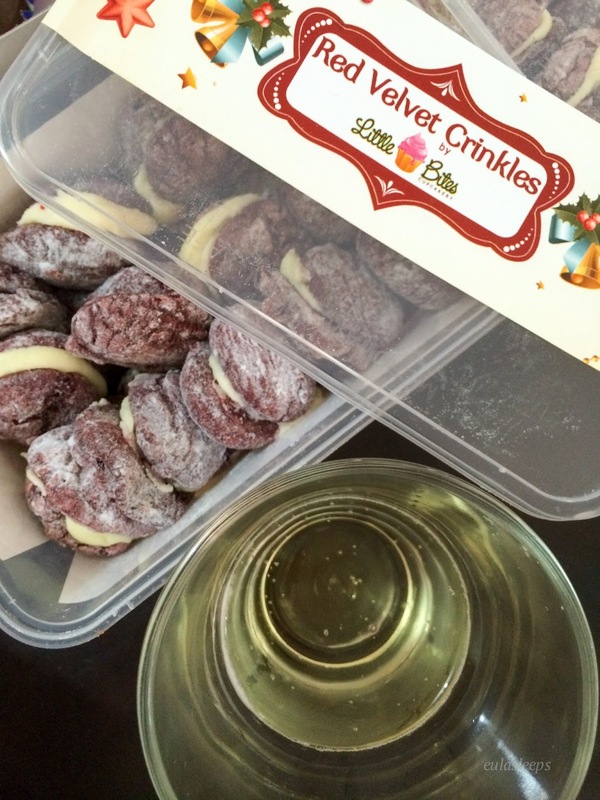 On that note, these Red Velvet Crinkles from Little Bites are so addicting! Two moist mini red velvet crinkles sandwiching a smooth cream cheese frosting, making for one delectable bite! Oh if only I could import these here. 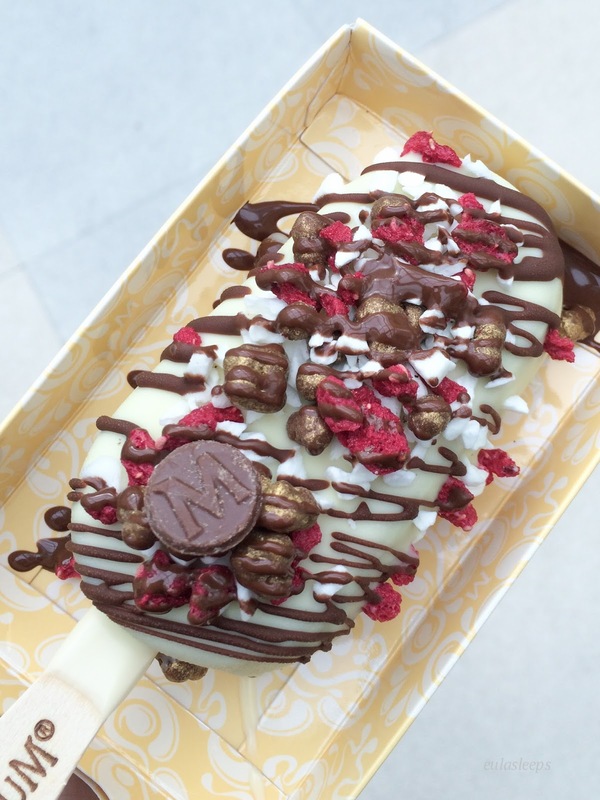 Lastly, we went to the famous Magnum Cafe, which is actually in the Philippines for a limited time. 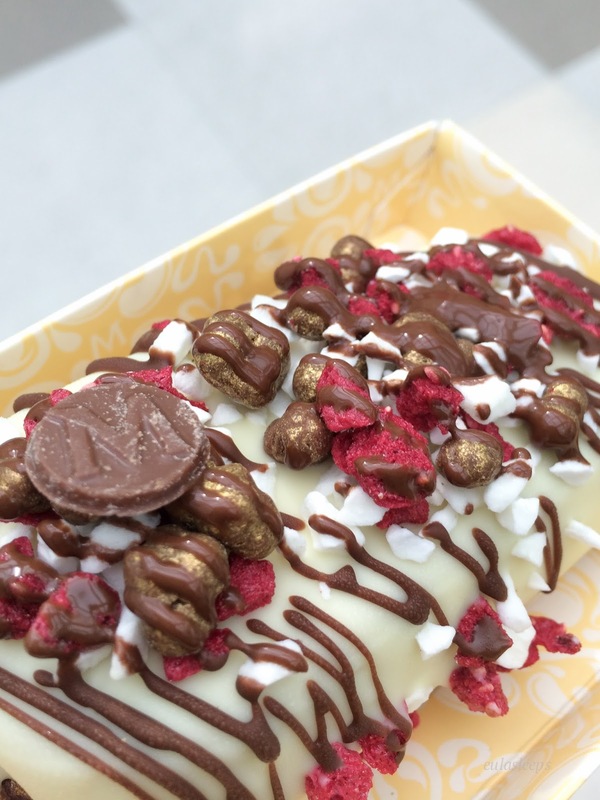 We opted for the make-your-own Magnum Bar. I chose my toppings based on color rather than taste, lol -- yogurt, dried raspberry flakes, and "golden nuggets" (crisped rice coated in gold tinged chocolate). Doesn't it look festive? 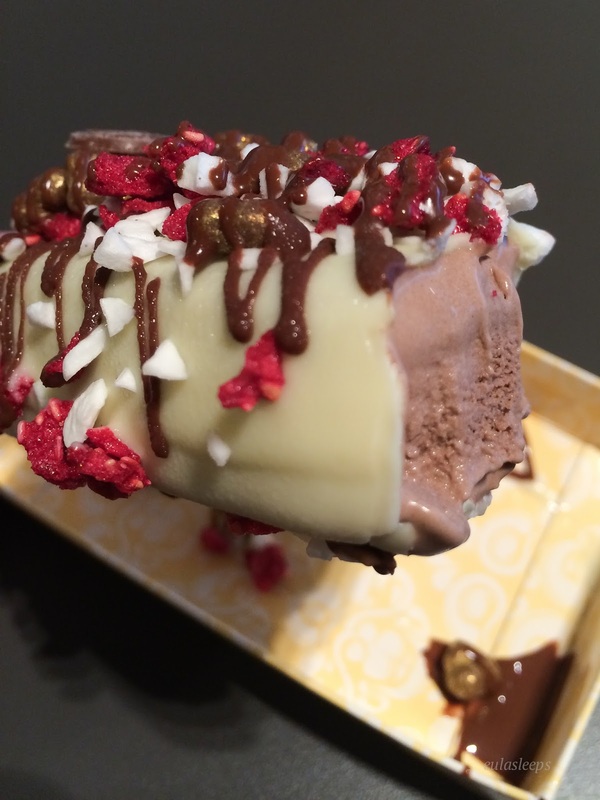 For the bar itself I had chocolate ice cream with vanilla coating. I needed a huge glass of water afterwards but it was an interesting experience! Next time (if I get another vacation before they close up shop) I'd like to try their hot dishes and specialty desserts. 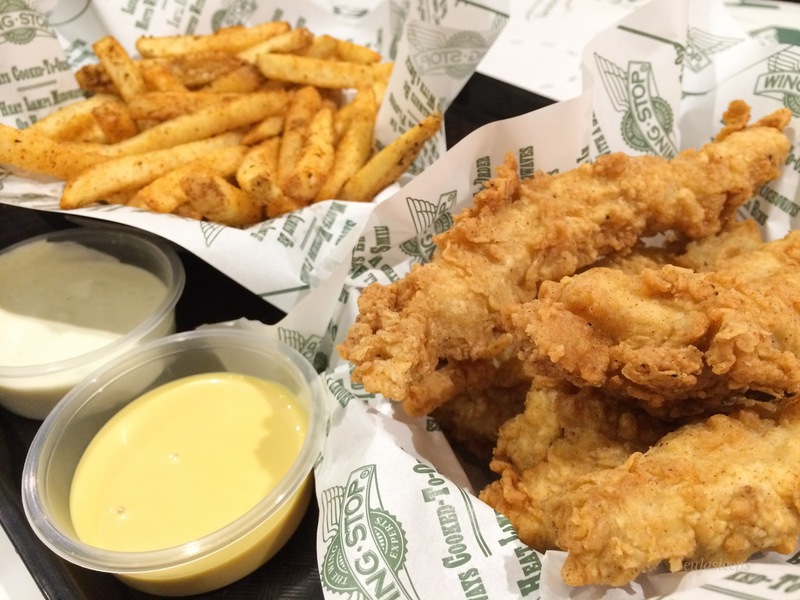 Wing Stop is a Texan original that serves variously flavored wings like Teriyaki, Cajun, Atomic, Mild, Lemon Pepper, and Garlic Parmesan. We opted for the more easily eaten chicken tenders with two dips, blue cheese and honey mustard. Served hot and fresh, it is perfect comfort food. The Cajun fries are deliciously spicy as well. We also dined at old favorites, Verbena and Antonio's in Tagaytay, Hamada at Baguio Country Club. Not to mention King Bee, that old reliable, and good ol' home cooking!